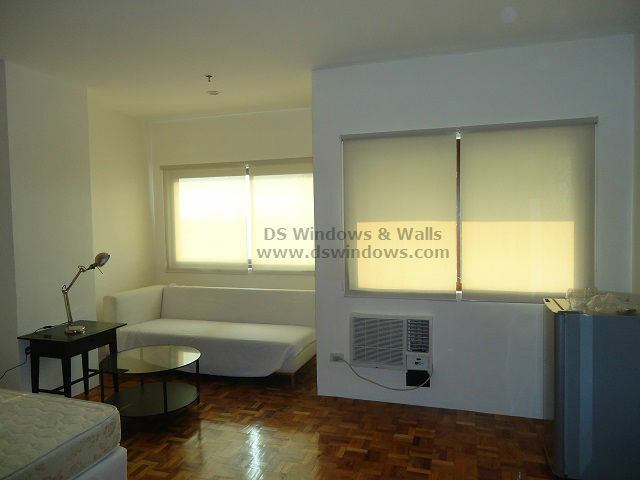 Roller Blinds for Single Studio Type Pad - Tomas Morato, Q.C. 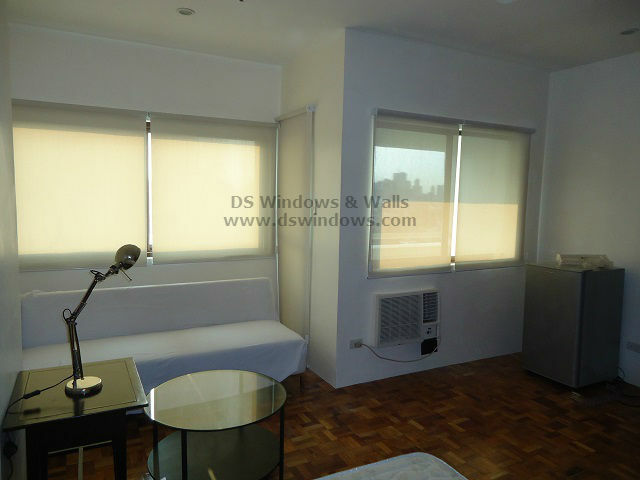 Home Roller Blinds Roller Blinds for Single Studio Type Pad – Tomas Morato, Q.C. Nowadays, more and more single men and women are choosing to live in a studio type pad rather than small apartments because of various benefits. The upside of a studio type unit condominiums (compared to bungalow type apartments) are the amenities which includes swimming pools, gym, lobby, and other recreational areas among others. Another major benefit is of course a tighter security and maintenance services. On the downside a studio type pad is usually small, just like that of our client in Tomas Morato, Quezon City. Owning a single studio pad comes with limited space which means you also have a restriction when it comes to designing your place. It’s a discouraging task in the beginning because you need to find a way to accommodate different activities that’s necessary in your home such as cooking, a place for watching TV and eating, a space where you can accommodate a guest and a comfortable space where you’re going to sleep. This is where your creative mind and ideas is needed to make it work. The general perception of single men or women might be all about carefree lifestyle with little attention to detail, but a lot of people like our client wanted to show some unique design that embraces classiness and modernity even if the space is limited. Given that the biggest obstacle is the small space, it’s wise to use colors that can help to make the room appear bigger and furniture that’s just enough to accommodate your basic needs. For our featured client they use white wall paint to make the room brighter and spacious. Window treatments can also make a huge improvement in the appearance and atmosphere of your studio type pad. For our client she opted to use Sunscreen Roller Blinds as her window treatment. First of all, using a sunscreen fabric let natural light enter your room that can make the room boost its ambiance and appearance. Natural light can brighten and cheer up your home’s appearance. The filtered dimmed light that’s entering your place provide a welcoming and peaceful ambiance in the room. Our client also chooses a light beige color for the roller blinds since bright color is suitable for small space it also give a little diversion with the plain wall paint and add style to the overall appearance of the studio pad. DS Windows & Walls is one of the leading company in providing blinds, carpet, accordion door and wallpaper. For more inquiries please call us at (02) 893-1373 / (02) 403-3262 / (02) 668-9668 / 0916-311-3909 or visit our showroom at 2nd level Pacific Mall Lucena City, 3rd level Robinsons Metro East, Pasig City and 4th level Waltermart, Makati City.